Chocolate Chip Cookie Dough Dip - Eat. Drink. Love. What the what?! Chocolate cookie dough dip?! 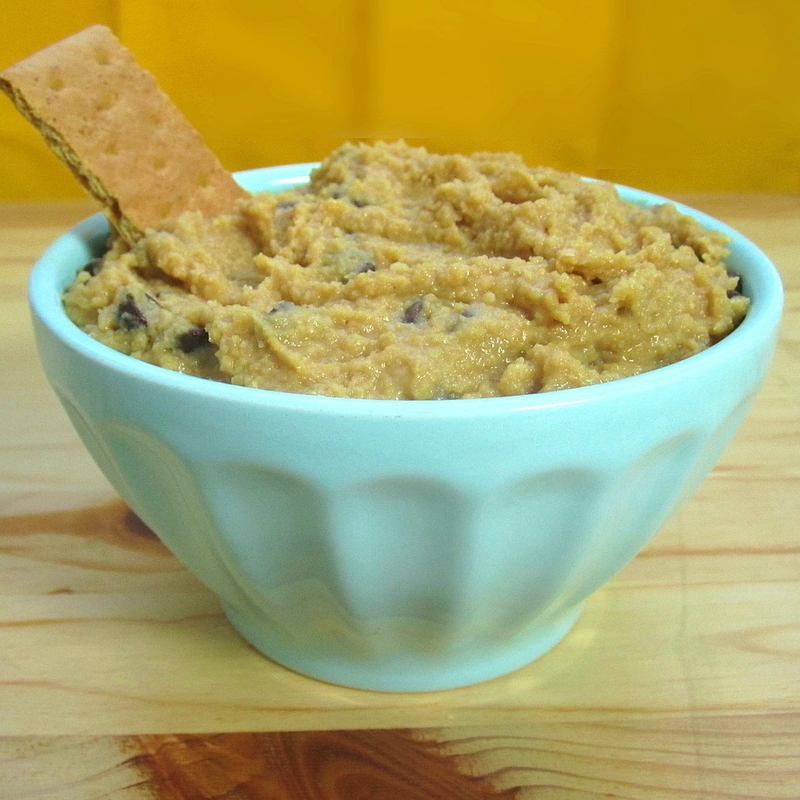 I know what you’re thinking, “OMG, that sounds delightful, but also horribly fattening!” I’m going to let you all in on a little secret…this cookie dough dip is actually healthy! It’s healthy because it’s made with chick peas! There is no flour, butter, oil, or eggs in this dip. I first saw this recipe last spring when Chocolate-Covered Katie posted it on her blog. My first thought was that there was no way this would be good. But, then after looking at her pictures and reading the comments, I started to think that maybe this is pretty good stuff so I added it to my list of recipes to try. I finally decided to make it last week! After whipping up a batch, I took a spoon and dug right in. At first, I didn’t like it at all. The texture was all wrong, so I let it go in the food processor for a little longer and went in for another bite and this time, I still wasn’t sure. I took some graham crackers and dipped them into the dip, still wasn’t quite sure. 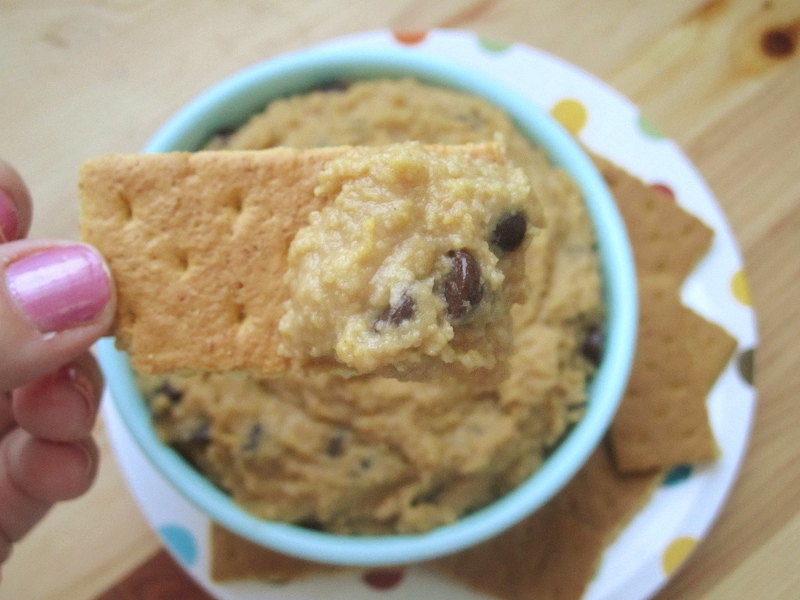 Two whole graham crackers later, I couldn’t stop eating this cookie dough dip. At that point, I decided it must be good! I stuck in the fridge for a couple of hours and served it at a party later that night. Just as Katie did, I didn’t tell people what it was until after they ate it. Maybe they were just being nice, but my friends said it was good! And perhaps it was the drinks I had, but I think this dip got better and better throughout the night! I served some graham crackers with this dip which was really great with it, and seriously, how often can you say that the stuff you are dipping into your dip is worse than the dip itself?! If you want a healthier dipper, I recommend some cut up fruit. Apple slices and strawberries would be wonderful! 1. Combine all ingredients (except chips) in a food processor or blender. Process until the mixture is smooth and achieves a texture that is similar to cookie dough. Stir in the chocolate chips. Cover and refrigerate until ready to serve. – If you want to make this sugar-free, you can swap out the sugar for Splenda or Stevia. Okay – that’s pretty cool! It’s the perfect way to sneak some nutrition into kids! I love this! I love hummus, so I get more than my share of chick peas, but the kids won’t touch the stuff. This would be a great way to get them to eat it. I can’t wait to try this one, maybe with nutella because we always seem to have it in the house. It is totally bizarre! Bizzare and yummy all at the same time! Whoa-enter the world of the versatility of chick peas! I have some, but I would never have come up with this. Time does seem to make all sweet creations better, so I hate to evaluate something after it is just made. I will need to try this one out-the idea of a cookie dough dip that is healthy is hard to pass up-thanks for sharing. This is such a great idea. I’m such a fool for cookie dough! Mmm…I’ve made her chocolate chip cookie pie with chick peas and it has been a hit time and time again. I am sure this is just as good. And what a novelty! Cookie dough you are allowed and supposed to eat right out of the bowl? YES please! Oh, how fabulous!!! Chocolate chip cookie dough is one of my favorite treats…and this dip would be a guilt free pleasure! OMG this is one of my best ideas I have ever heard!!! I love that there are chickpeas in it…. how creative. I love Chocolate Covered Katie too.. shes adorable! i think I am in the same spot as you with the thinking process. It looks delicious…I just don’t know about the chickpeas. That being said I have a can sitting in my pantry that is not calling my name for this recipe. Very interesting! Let me know if you like it, Emily. The texture did freak me out a little bit at first. You can try adding more peanut butter if you don’t like the recipe above. I do believe that since it does not contain any flour, that it is gluten-free! Okay I am not even sure what to say about this dip except I can’t believe I’ve never had any!!! I think all dips should be in cookie flavors lol this sounds yummy! I agree!! I’m going to try a brownie one next! This is REALLY interesting! At first I thought it’s real dough like with flour and eggs etc. I think this is a fun item for party – people will be very interested in trying it out! It does look exactly like actual cookie dough, doesn’t it?! Definitely thinking outside of the box on this one! What an interesting concept. A kind of sweet, chocolate hummus-ish dip. Intriguing! I’ll take a big bowl of that, please. Thank you. It’s made with chickpeas?! I am fascinated and will have this a try! That really sounds like fun, my kids will love this one! thanks for the share. Haha, the texture is what got me at first. Then I realized I forgot the peanut butter. That really really helped give the dip a creamier and smoother texture more similar to actual cookie dough. In fact, if you make it just as it says above and don’t like it, I would say to try adding more peanut butter! OMG are you trying to get me fat? I love this dip!!! You are so creative! That’s the beauty of this dip, Claire! It won’t make you fat! This is one of those too-interesting-not-to-try recipes. Chocolate chips and chickpeas? I have to check this out! Ok, first things first, loving the pink polish :0 – I have never heard of cookie dough dip but I have heard of chocolate-covered Katie and I’m not surprised. What a fun and inventive recipe – and certainly a whole lot healthier than one you would expect from the title. The graham cracker is fun too! 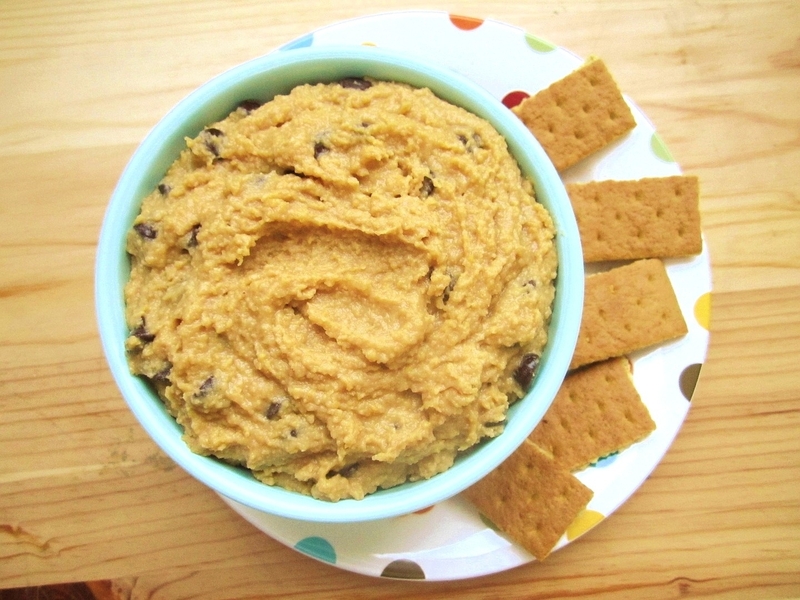 oh my goodness, and when I thought the black bean chocolate dip is the invention of the year you show up with this chickpeas dip! LOVE it. I MUST try it! MUST!! Ohh, a brownie-like dip is definitely happening in my future…soon…very soon..
I’m fascinated slash vaguely worried by this dish. I think it definitely goes on the try list though just for the completely craziness of it. Lol, nothing to be worried about! I totally recommend giving it a try sometime! Pingback: Brownie Batter Dip « Eat. Drink. Love.